Some of these titles have been around for awhile, and some are brand-new, but these are the books that had me cheering, crying, thinking and celebrating a bookish life in 2017. Good Night Stories for Rebel Girls: 100 Tales of Extraordinary Women by Elena Favilli (Ages 3-18 – short story collection) This beautiful volume is packed with stories about the lives of women from the past and present and is animated by 60 female artists from around the world. A perfect cuddle up family book! You Are Here: An Owner’s Manual for Dangerous Minds by Jenny Lawson (Teens and up – interactive book) Through doodles, anecdotes and inspirational messages Lawson shares some of her struggles and encourages others to fight theirs. It’s hilarious, touching, memorable and shareable. The First Rule of Punk by Celia Perez (Ages 8-12 – novel) Malu can’t quite find her place in her new school. She’s a zine making girl with punk rock style. She works to find her tribe and discovers more about herself in the process. The Nix by Nathan Hill (Adult – novel) From 1968, to current day and back again, The Nix is about family, tradition, class struggles, politics, capitalism, technology and love and is told with fresh techniques and powerhouse writing. True West by Sam Shepard (Adult – play) This classic Shepard play examines the relationship of two brothers and visits his common themes of double nature, wanderlust, conflict, and honesty. The Terrible Axe-Man of New Orleans by Rick Geary (Adult – graphic novel) Nights of terror! A city awash in blood! This documentary style telling of the infamous crime is masterfully told and playfully illustrated. Lucia the Luchadora by Cynthia Leonor Garza (Ages 3-7 – picture book) After being told that girls can’t be superheroes, Lucia learns a family secret from her Abuela and creates her own new kind of hero. The perfect marriage of text and illustrations. Spill Zone by Scott Westerfeld (Teen and up – graphic novel) Addison and her sister Lexa are forging their own future after their city Poughkeepsie is destroyed by a mysterious spill. Addison ventures in to take and sell photos and what she sees in unexplainable. Add in Lexa’s creepy doll Vespertine who has unique abilities and this is a grand opening to what will certainly be a thrilling series. We Are Okay by Nina LaCour (Teen and up) Marin picked up and moved into her college dorm without telling anyone. No one knows what happened, not even her best friend, Mabel. Alone for winter break, Marin must face her story when Marin visits. Written with a deep emotive poetic voice and masterful skill this book resonates long after reading. Commonwealth by Ann Patchett (Adult) Spanning five decades, several families lives are forever changed by an unexpected romantic encounter. It reverberates through generations. A classic American epic tale. 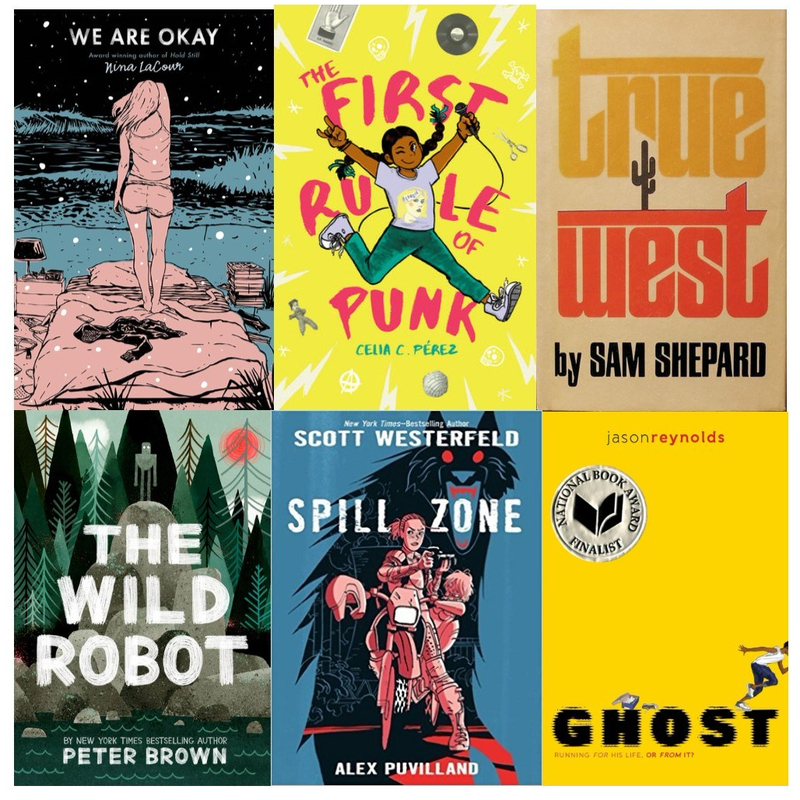 Other favorites: The Wild Robot by Peter Brown, Ghost by Jason Reynolds, Snotgirl by Bryan Lee O’Malley, The Humans by Matt Haig, The Hate U Give by Angie Thomas, Lady Killer by Joelle Jones, Topdog/Underdog by Suzan-Lori Parks. Previous “Bomb City” Trailer Drops Today!